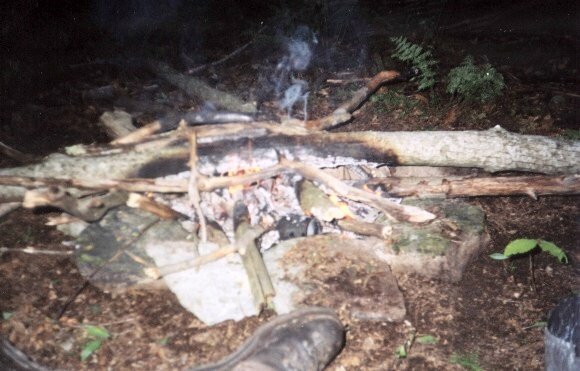 This 14.7 linear backpacking trip took place the weekend of May 22-23, 2004. Participants were Frank Maida and myself. 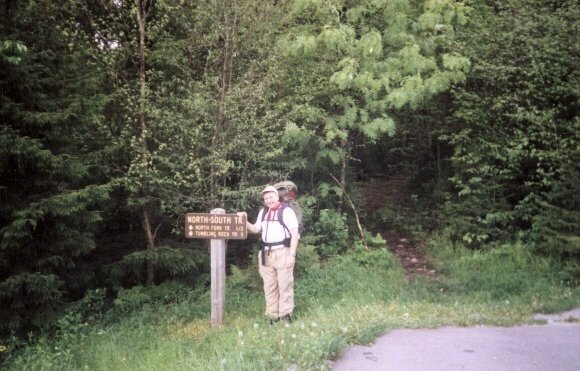 05/23/2004- It was a long drive to this hike. It was tough to get away from work. It was tough getting up that morning and then even tougher trying to find where I told Frank M to meet me that morning. But I did and we got the hike started around 11AM that Saturday morning. 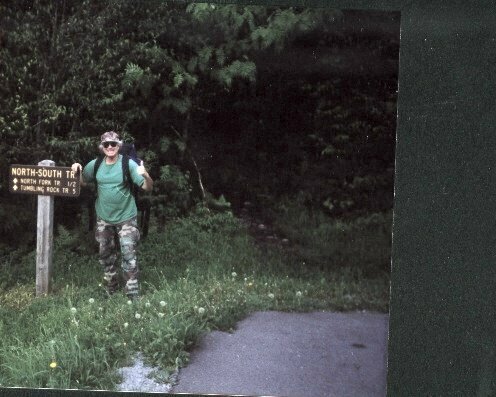 The plan was to hike the North-South Trail from WV150 west to the Cranberry Campground, where Frank M camped out the night before. The weather was an alternating sequence of clouds, sun, breezy and humid. No rain, though it looked like it a few times. 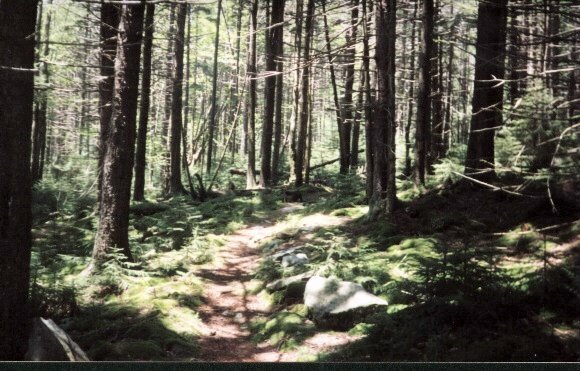 We were at around 4000 feet at the beginning so there were alot of pines and moss on the forest floor. But, as we descended, the trees became more varied. We then started ridging a good deal the rest of the day. The ups and downs were slight, but they were numerous. Water was a bit of a problem on this stretch. There were numerous small springs along the way, but no streams to filter water. At one point, I had to dig a hole at one of these small springs so that I could place my filter "acorn" within it and draw some water. The trail was somewhat easy to follow. We only had one instance where we actually lost the trail due to alot of blowdowns. The scenery was nice but there were no real neat views. We left the Cranberry Wilderness, entered the Cranberry Backcountry and started looking for a campsite at around the 8 mile mark around 6:30PM. We found one, but it had no water source. So we rationed out our water and had a nice quiet evening. Frank made one of his famous fires and we had dinner and "shot the bull". Temps that day were in the high seventies, low eighties and in the high fifties, low sixties that night. 05-23-2004- The night was quiet and gave a good night's sleep. The next morning, we ate breakfast and discussed that day's trek. We were concerned about the lack of water on the North-South Trail and the possibility of an alternative route. The next side trail that we would come to was the Rough Trail. It led to the Cranberry River where we would pick up FR76 and take it back to the campground. This turned out to be a very good decision. The Rough Trail, though only about 3 miles, was fantastic! There were streams, waterfalls, artifacts from the days that rail lines crisscrossed this mountain for harvesting timber. We found old cook pots, branches holding a half dozen old horse shoes, old wash basins, train parts and more just rusting away. We also got a few sprinkles of rain on this stretch, though not for long. This was the only rain encountered during the hike. The trail was also mostly downhill, which was also nice. We then got to FR76, which was gated at either end so that hikers, bikers and horses could enjoy it. The surface was crushed gravel, like the Stony Creek Trail in PA, and again was mostly downhill. We walked this road the last 4 miles back to the Cranberry Campground. There were a lot of fishermen on bikes along the way as well as regular bicyclists. We saw a boy scout troop as well finishing up a backpacking trip. There were also numerous shelters along the way. This could be part of a future backpacking trip. So changing the game plan half way through turned this into a great hike. There are a lot more hiking opportunities in the Cranberry Wilderness and Backcountry. I thought that I was done hiking this area but now, I think I'll be back. Frank M at the trailhead. Mike C at the trailhead. 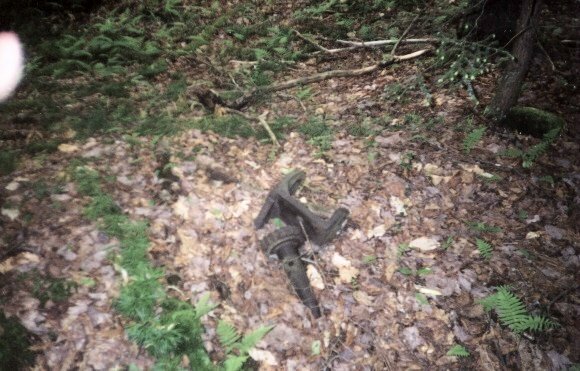 Old train parts on Rough Trail.